Royal Tour Canada 2016 - What Would Kate Do? The Duke and Duchess of Cambridge are heading to Canada for their next Royal Tour from September 24 – October 1st, 2016. 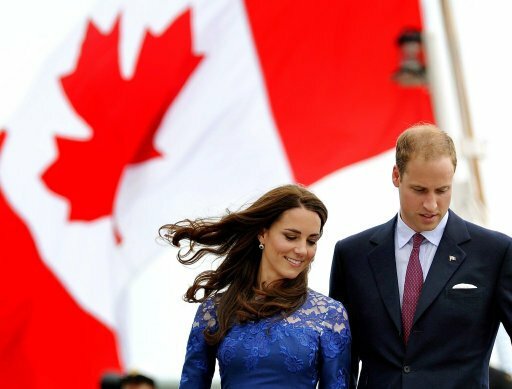 The couple will visit numerous communities throughout British Columbia and the Yukon. This will mark the Cambridge’s second trip to Canada, their first being a wildly successful tour in 2011. This trip will mark the return of the couple with their two young children, Prince George and Princess Charlotte, in tow. This page is your go-to source for everything #RoyalVisitCanada! Check back often as it will be updated with news, schedules and event recaps as they happen. The official itinerary was released on August 22, 2016. The West Coast of Canada is a gorgeous part of the world, renowned for it’s outdoor beauty which the couple is keen on exploring whilst they are in the region. Victoria Airport Arrival : The family will travel to Victoria with the Royal Canadian Air Force and will be greeted at Victoria Airport before moving to Government House – where they will be based throughout the tour – for a very brief stop. Visit to British Columbia’s Parliament Buildings : William & Kate will officially open their tour by paying respects at Victoria’s Cenotaph and will unveil a new plaque paying tribute to the veterans of Canada’s involvement in the Afghanistan conflict. The official welcome to Canada will then get underway, featuring an honour guard and speeches. Parliament is located right on Victoria’s waterfront and this official welcome will be open to the public. It will give The Duke and Duchess a chance to say hello to the people of Canada just hours after touching down in the country. Government House Meetings : Following the Parliament events, Their Royal Highnesses will return to Government House where they will have meetings with senior Canadian leaders. Arrival to Vancouver : The Duke and Duchess travel from Victoria to Vancouver by float plane. Float planes are the quickest way to travel between the two cities and are one of the real symbols of this part of the world. They will land in the harbour in the heart of Vancouver. Civic Welcome at Jack Poole Plaza : They will receive a civic welcome in Jack Poole Plaza located by the Vancouver Trade and Convention Centre. The Plaza is named after the late Jack Poole, who was a key player behind the success of the 2010 Winter Olympics and 2010 Winter Paralympics held in Vancouver. This welcome will allow The Duke and Duchess to get an immediate sense of Vancouver’s energy and dynamism. Downtown Eastside Visit : The Duke and Duchess will travel to the Downtown East Side of Vancouver to meet the amazing team at Sheway, a charity that has achieved remarkable things for vulnerable mothers who are battling addiction and other issues. Prior to Sheway’s inception in 1993, babies born to mothers with substance use issues living in the Downtown East Side had their babies removed at birth. These babies were frequently premature and underweight. Today, 88 per cent of the babies are born full term and are of average birth weight. In addition, 74 per cent of the children born today leave the hospital in their mother’s care. The link between addiction and family breakdown is something that has been a major priority of The Duchess’s charitable work. Immigration Services Society Visit : They will then visit the Immigration Services Society of British Columbia. Here they will meet the staff and volunteers who support over 25,000 recent migrants to Canada each year, including some of the 30,000 who have arrived in Canada over the last year from UNHCR camps that are supporting those who have fled the war in Syria. They will explore issues including housing, education, employment, language, and mental health and will have an opportunity to engage directly with Syrian refugees. Young Leaders Event : The Duke and Duchess will then attend an event celebrating young leaders in Canadian arts, music, sport, charity, business, and film. Their Royal Highnesses are pleased to have this opportunity to meet with people of their generation who they might have the chance to get to meet again over the years. Kitsilano Coastguard Station : The final engagement of the day will see The Duke and Duchess learn more about the first responders who work together to keep Vancouverites safe as they enjoy life in their city. They will visit the Kitsilano Coastguard Station in Vanier park and learn about the round the clock operation to support people who come into trouble on the water that surrounds this coastal city. They will then meet with other first responders who protect the safety and physical and mental health of people in the region, including police and fire services and social workers. The Duke and Duchess will then depart the area by the Coast Guard’s hovercraft, flying back to Victoria for the evening. Arrival to Great Bear Rainforest : The Duke and Duchess will travel to the Great Bear Rainforest – the world’s largest temperate rainforest, located on the beautiful Central Coast of British Columbia. I am pleased to say that the Premier of British Columbia has today announced that Great Bear has been named as Canada’s commitment to The Queen’s Commonwealth Canopy. Launched at the Commonwealth Heads of Government Meeting in Malta, in 2015, the QCC is a unique network of forest conversation initiatives, which involves all 53 countries of the Commonwealth. The QCC present a rare opportunity to unite the whole Commonwealth family and save one of the world’s most important natural habitats, forests. By creating a pan-Commonwealth network of forest conservation products, the QCC will mark Her Majesty The Queen’s service to the Commonwealth while conserving indigenous forests for future generations. Aerial Tour of Rain Forest : Immediately on arrival at Bella Bella airport The Duke and Duchess will transfer to a float plane where they will be given an aerial tour of a section of the vast rainforest. They will then land on the water at Bella Bella’s main jetty where they will be ceremoniously welcomed by the Heiltsuk First Nations community. Youth Performance : From there they will be guided by young people through Bella Bella to the community centre where a youth performance will take place. There will also be an opportunity for speeches on the significance of the QCC at a separate event following this performance. Mcloughlin Bay : The party will then travel to nearby Mcloughlin Bay where the rainforest will be officially committed to The Queen’s Commonwealth Canopy during a brief ceremony. The party will have an opportunity to see one of the new walking trails being constructed in the area before departing by boat and returning to Victoria. 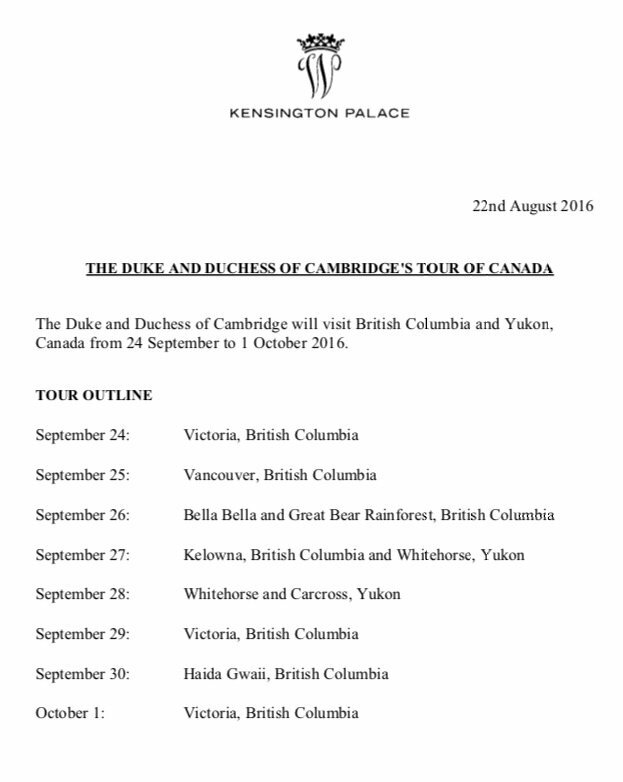 Reception in Victoria : That evening in Victoria, The Duke and Duchess will attend a reception hosted by the province of British Columbia at Government House. Arrival to Kelowna / University of British Columbia Okanagan Campus : Their Royal Highnesses will fly to Kelowna, a city in the beautiful Okanagan Valley. Their first stop will be the Okanagan campus of the University of British Columbia. UBC is one of the world’s finest research universities and recently celebrated its centenary. The campus in Kelowna opened a decade ago and plays a vital role in the region, home to 600 current research projects and 8,000 students. The Duke and Duchess will have a chance to meet with students and the wider community before watching an exhibition match with the campus’ nationally ranked women’s volleyball team. Taste of British Columbia Event : They will then take part in the BC Government’s ‘Taste of British Columbia’ festival at Mission Hill Winery. The Okanagan region is producing world-class wine, cheese, and food and The Duke and Duchess will have a chance to sample some of the province’s best offerings. They will also meet with local young people who are learning about potential careers in food and agriculture. Whitehorse Arrival : Their Royal Highnesses will then fly to Whitehorse, Yukon. When they arrive in the early evening, they will be greeted by members of the Canadian Rangers, the military branch that provides a presence in the north of the country. The Duke and Duchess will also get to meet some of the young people who serve in the Junior Canadian Rangers that evening. Cultural Performance Event : Later that evening they will watch a cultural performance at the Kwanlin Dün Cultural Centre. Their Royal Highnesses will stay in Whitehorse overnight. MacBride Museum : The Duke and Duchess will get a real chance to see the natural beauty of Yukon and to learn about its people. The day will begin with a visit to the MacBride Museum, where they will learn about Yukon’s history. The Queen and The Duke of Edinburgh visited the telegraph office, now part of the museum, in 1959. Party on Main Street : Next up will be a colourful and fun party on Main Street in Whitehorse. Whitehorse has a thriving arts scene and local artists and craftsman will have their work on display, and you should also expect plenty of music and local food. Drive to Carcross & Arrival : The Duke and Duchess will later make their way to Carcross, a small town of less than 300 people 70 kilometres from Whitehorse on the Klondike Highway. The scenery along this drive is spectacular. At the Carcross Commons they will have a traditional welcome from the Carcross/Tagish First Nation and will be given a tour of the recently completed buildings and public spaces there and will have a chance to say hello to the local community. Montana Mountain : The Duke and Duchess will then travel a short distance to the beautiful Montana Mountain where they will visit what must be one of the world’s most picturesque destinations for mountain biking. The Single Track to Success (S2S) project on Montana Mountain not only builds world class trails, it provides life changing experiences to local youth and contributes to tourism in the area. Farewell & Return to Victoria : Their Royal Highnesses will then travel down to the bottom of the track and bid farewell to the young people and the community before heading back to Whitehorse Airport and on to Victoria. Childrens Party at Government House : The Duke and Duchess will attend a children’s party in the beautiful grounds of Government House. A group of military families have been invited to share what should be a really lovely morning with plenty of surprises for the children. Private Time with George & Charlotte : The rest of the day will provide The Duke and Duchess some private time with their children. Arrival at Skidegate : Their Royal Highnesses will have the privilege of visiting Haida Gwaii, the archipelago on the northern coast of British Columbia that is home to the Haida Nation. It is a remote, but very special place.When the couple arrive at Skidegate, they will transfer to a traditional Haida canoe and will help to paddle around to the beach at the Haida Heritage Centre and Museum, where they will be officially welcomed. Inside the centre they will be addressed by the President of the Haida Nation and see a cultural performance from around 30 local children. Opening of Haida Gwaii Hospital : The Duke and Duchess will then have the honour of officially opening the new Haida Gwaii Hospital and Care Centre. This impressive new facility will house several new services that have recently transformed medical provision on the islands. People no longer have to leave Haida Gwaii to have children, for instance, and families can be close to their loved ones as they receive care late in their lives. The Duke and Duchess will meet with people who have benefitted from these services. Skidegate Youth Centre Visit : Before leaving Haida Gwaii, The Duke and Duchess will join youth from the Skidegate Youth Centre where they will enjoy world-class fishing on the beautiful waters of the Hectate Strate. The Skidegate Youth Centre serves the youth of Skidegate and surrounding areas engage in safe and meaningful social, recreational and educational activities. The programme focuses on confidence building, physical activities and creativity, while achieving social and life skills. Cridge Centre Visit : The first engagement will be a visit to the Cridge Centre for the Family – one of Victoria’s most well-known charitable institutions. The Centre provides a range of services, including childcare, youth outreach, and support for women who have experienced domestic violence. Local Café Kelty Mental Health Visit : The Duke and Duchess will then then visit a local café where they will meet with families that have been supported by the Kelty Mental Health Resource Centre, one of British Columbia’s leading mental health charities. Kelty uses digital and community-based tools to take mental health services and information to families throughout the province. This focus on signposting and information provision chimes closely with the work that The Duke and Duchess are focusing on along with Prince Harry through their Heads Together campaign. Tall Ship Engagement : Then they will board a tall-ship operated by the Sail and Life Training Society, a charity that uses the power of sailing to give young people skills and direction in their lives. On board will be a group of young people who are part of JACK.org – a national network of youth who are working to end stigma around mental health for their generation. The Duke and Duchess will have a chance to talk to these young people about their work while actively taking part in helping to sail the tall ship before docking in the inner harbour. Public Official Departure Ceremony : The Duke and Duchess end their tour by taking part in a public official departure ceremony at Victoria Harbour Airport. The Harbour airport is located in the centre of the city and will be a perfect place for Their Royal Highnesses to demonstrate their gratitude for the hospitality that will have been extended to them over the previous week. They will then board a float plane and will have a brief tour of the southern tip of Vancouver Island before departing Canada with the Royal Canadian Air Force. What Might Kate Wear in Canada? What Would Kate Do in Vancouver? What Would Kate Do in Kelowna?